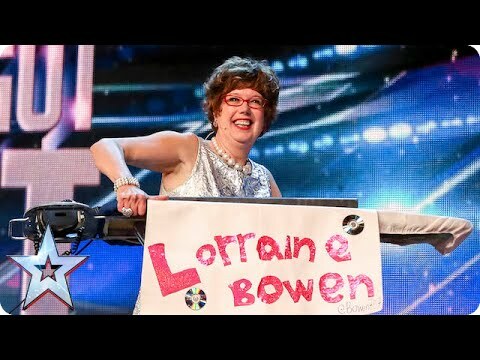 Now known as The Crumble Lady, Lorraine Bowen won David Walliams’ Golden Buzzer on Britain’s Got Talent 2015 and has attracted tens of thousands of new fans of all ages; children are singing the Crumble Song at school, as are grown men in factories. Lorraine Bowen is a unique performer! Quirky costumes, original idiosyncratic songs, vintage Casio keyboard played on an ironing board. She adores the fashion sensibility of the 1960s and has one of the largest polyester wardrobes in the UK. Lorraine began her career playing piano with Billy Bragg in massive venues in the UK and stadiums in Europe as well as both sides of the Berlin wall. Since then she has produced 5 albums, downloads,has 100 videos on her Youtube TV Channel and regularly performs nationally and internationally. David Walliams wrote – She is genuinely really funny and talented. She’s a British eccentric, she’s half way between Miranda Hart and Victoria Wood, she’s got that lovely warm sensibility about her. In the semi finals of Britain’s Got Talent David ironically introduced Lorraine to the nation as Britain’s answer to Beyonce! She is genuinely really funny and talented. She’s a British eccentric, she’s half way between Miranda Hart and Victoria Wood, she’s got that lovely warm sensibility about her.